The latest topic for the WashingtonExec Strategic Human Capital Council, “Retained Search as Part of Your Talent Acquisition Strategy,” was presented by Louis Montgomery and Irv Towson; both Managing Directors at the boutique retained executive search firm Reffett Associates. “Navigating executive search just got easier for the HR executives who attended the December 3rd meeting of the Human Capital and Critical-Talent Council dinner. 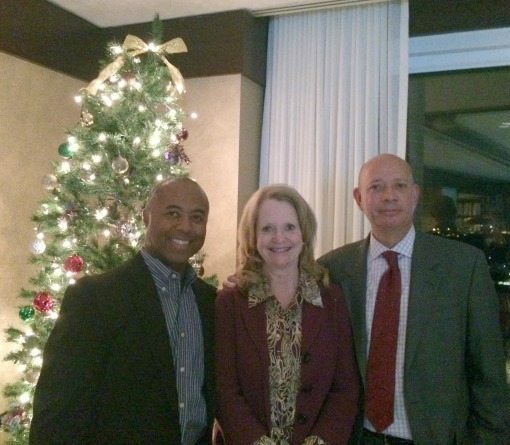 Louis and Irv were able to share from their previous experiences as HR executives on how to select an executive search partner and how to conduct a successful search,” Kay Curling told WashingtonExec. The group of Human Capital Executives as well as pre-selected critical talent professionals discussed the value of having a strong professional network when deciding what type of search firm the company needs, determining if a national or local search is necessary, and finding out what areas are “off-limits” for specific search firms. The two keynote speakers recommended that if an executive search firm does not offer up front where it does not have access or what organizations for a search might be a conflict of interest, then the firm is most likely not confident about the search and the HR executive should look elsewhere. “Today there are many options and variations in executive recruiting; anyone with a phone, LinkedIn account or an email may consider themselves a recruiter. However, executive recruiting is all about relationship building, and you want those relationships established before you initiate a search. After all, the most attractive and ideal candidate for a position is frequently someone who is not an active job seeker, but is someone who is currently generally content with their current employment,” said Montgomery. Ideally, the Human Capital executive within the organization is the conduit between the selected search firm and the company C-Suite. The role of the Human Capital executive is continuing to evolve within the government contracting industry. As organizations are being asked to “do more with less” human resource representatives will be asked to elevate their strategic value to the C-Suite by building relationships with those within the industry and with outside service providers, such as executive search firms. The Council is led by Co-Chairpersons Eleni Antoniou, VP of Human Capital of FCi Federal and Kay Curling, SVP and Chief HR Officer of Salient Federal Solutions. Each participating government contracting company sponsors a human resource executive and nominates one critical talent individual for this WashingtonExec Council. This one-of-a-kind group allows the VP of HR the opportunity to help develop the next generation of HR leadership while building their own networks. Alan Berson, Executive Coach and Author of Leadership Conversations: Challenging High Potential Mangers to Become Great Leaders, David Kriegman, Author of Zero to a Billion: 61 Rules Entrepreneurs Need to Know to Grow a Government Contracting Business, Dr. Stephen Fuller of George Mason University’s (GMU) Center for Regional Analysis and Dr. Ginny Bianco-Mathis of Marymount University are all previous keynote speakers for the group. The Council had its first meeting in January of this year. The Council also hosted a C-Suite panel with Jodi Johnson, CEO of Titania Solutions Group, Anne Donohue, Senior Vice President & General Counsel at SRA International and Mark Serway, CFO of Govplace.